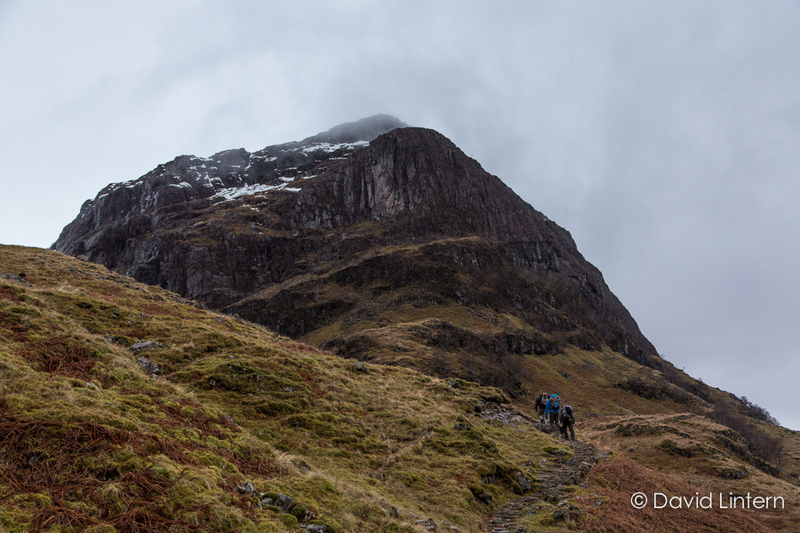 Mid January, and a plan for an attempt on Sron na Lairig, a relatively straight forward ridge climb near Glen Coe. Actually, that route had been a stone in my pocket ever since an amazing weekend around the Ben Alder massif last year. I wanted Sron na Lairig for the reprise, as if to prove it wasn't a fluke. This weekend was the promising sequel that turned out to be the difficult second album. The group swelled from 1 to 4, just as another weather window fizzled out with a whimper. In truth there was never a window, just wishful thinking. Below 600metres it rained consistently, above that our gritty winter persisted. The public house was frequented, plans hatched then dispatched. Saturday morning we walked out of the rain and into a broken freezer. It didn't matter, Stob Coire nan Lochan was magnificent. Photography this winter for me has been mostly about scale, and despite my mountain ambitions for that ridge being completely thwarted this time out, those few hours in a different coire on a different mountain made this trip so worthwhile. I probably learnt more that afternoon in one place than in many previous trips of passing through. Not sure I can put my finger on why, but something clicked. I made a connection, or maybe just renewed one. I think it had alot to do with the clarifying, simplifying effect of all that white, all that rock, and seeing all those people, in their place, making their connection. And their place it most definitely was. 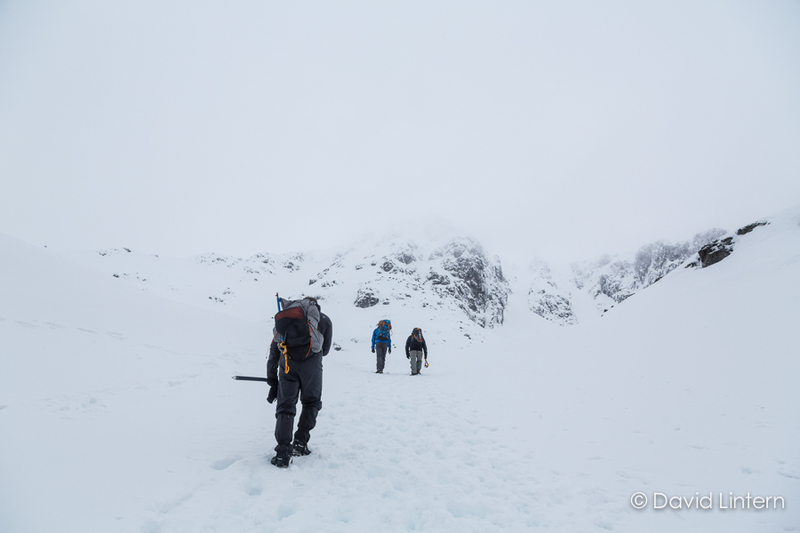 Lots of folk were out despite the dreich down below, labouring up Broad Gully in deep drifts, distant cries from the cliff faces above as they helped each other up the Dorsal Arete. A genuine privilege to share in such an amazing space with other people who just get it, whatever it is. Profoundly pointless, superbly heroic, and all in miniature. We walked up a ways, I don't think any of us were really sure how to tackle it all - so much gentle threat, so little time! So we dithered a little, and then turned back from a half hearted snowy walk as the winds picked up. As it turned out, a few hours in the bowl was probably about right. There was some winter skills practice, some finding of winter feet, and some new skills gained. Phil set about doing confusing, instructive things with rope for fun which looked useful but I still had my head in the clouds, and went off for more photos. He's really good at exercises. I don't like theory, I prefer practice. This isn't clever and doesn't always work to my advantage. I went up into the upper coire. A few moments on my own. ''No, not that carabiner, the other one'' said a voice far above me, a slight tightness in the voice betraying the anxieties of a guide trying to get his team over the crux before the weather deteriorated further. 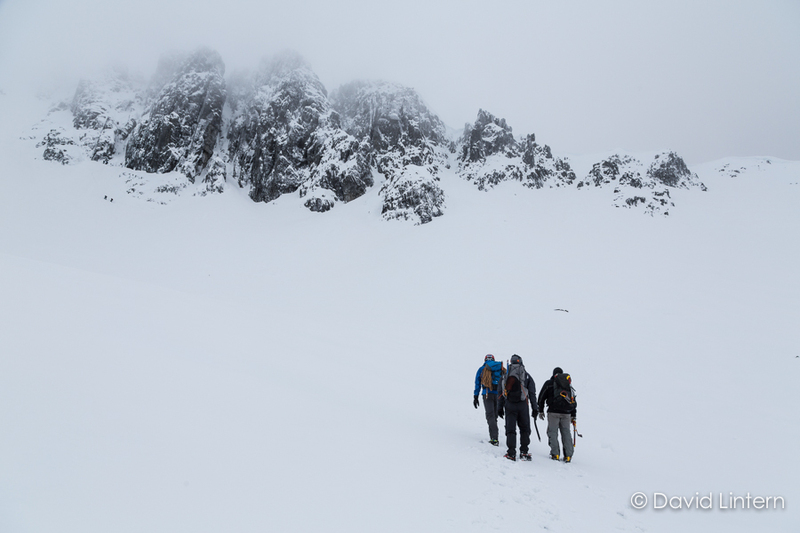 Another solitary figure already disappearing into the spindrift high on my left, heading for another gully tucked away in the corner, behind the central buttress. Stopping for whole minutes to catch his breath, then grinding away at the slope again in first gear. Silence. A black and white epic in here. We didn't make Sron na Lairig. We walked in for it early next day after a big thaw and still more rain, but it was a formality just to get to the head of the glen. The ridge was a soggy mess, not remotely in condition. We saw a team of two turn back one third the way up as we turned tail and made for home. It looked tenuous. ...there's more photos of tiny lickle people in really ginormous places in the next issue of Mountain Pro. In the meantime there's 1 or 2 more from this trip in the portfolio. Prints? Yesiree, email me.